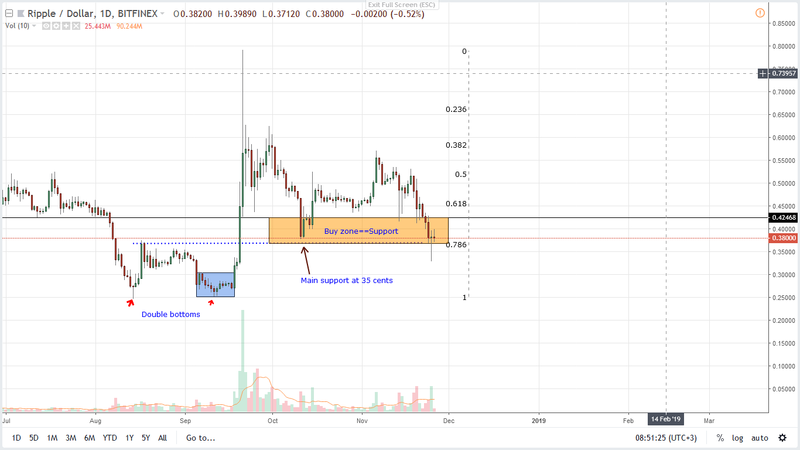 Ripple Price Analysis: XRP/USD Steady above 35 cents, Path to 60 cents? Technically, XRP/USD is bullish. As long as prices are trending above 35 cents, buyers can continue ramping up in lower time frames. This is so because the coin is increasingly becoming a utility and a store of value thanks to its low volatility—down 22 percent in the last week compared to BTC at 32 percent. By 2021, the eCommerce market is expected to hit $4.88 trillion market. That’s almost twice the total sales volume made in 2017 where statistics indicate that the three leading retailers—Amazon, Walmart and Apple made up nine percent of the market churning around $99 billion on total trading volumes. With endorsement from former eBay Chief Product Officer–R.J. Pittman, it paints a rosy picture of what the future holds for Ripple and their main solutions. Though it should be understood that Ripple and XRP is designed for big institutions and banks as they bid to curve out some market share and even replace the most dominant player in the remittance space, Ripple is working overtime to increase the number of companies that can utilize its innovative solutions. Companies plugged in to the RippleNet have seen better efficiency, expediency and cost savings. Therefore, it will be interesting to see if these platforms embrace change, phase out their antiquated payment systems integrating transparency and speed where at any stage of the supply chain, buyers or merchants can know the status of their transactions. Despite tumultuous price action, XRP is still the second most valuable coin in the space. We reckon that with their increasing partnership and tapering volatility, it can as well be a reliable harbor during this stormy period. 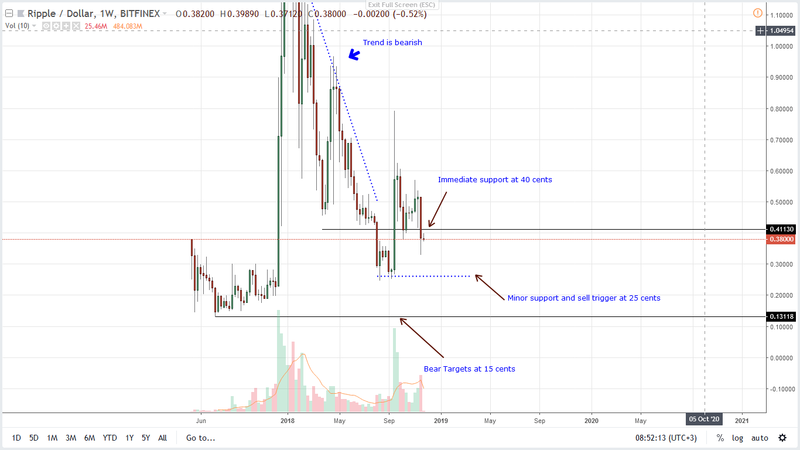 Unexpectedly, XRP increasing demand is mostly because of its low volatility and though it is down 22 percent in the last week, XRP/USD is technically a buy as long as bulls reject lower lows preventing price drops below 35 cents—40 cents support zone. Notice that despite sharp losses of last week, volumes are still low and compared to week ending Sep 23 when prices erupted from 25 cents main support to 80 cents—our ideal bull targets, market participation is very low to warrant a shift of momentum to bearish. However, should there be further losses and XRP collapse below 35 cents, then aggressive traders should begin unpacking in lower time frames with first targets at 25 cents and even 15 cents. Conversely, any injection of bull momentum and prices expand above 60 cents or Oct highs and both set of traders can load on dips with first targets at 80 cents, $1 and later $1.65. Back to the daily chart and there is a clear rejection of lower lows thanks to yesterday’s pin bar closing inside our buy zone. As it is, this points to increasing bull demand in lower time frames. Since we are generally bullish on this coin and XRP/USD is generally trending inside our buy zone between 35 cents and 40 cents, aggressive traders can buy at spot with safe stops at Nov 25 lows of 32 cents. First targets will be 60 cents or the 38.2 Fibonacci retracement level anchoring on Sep 2018 high lows.